International WAN network service, cloud connectivity offerings, + network coverage of 180 leading WAN service providers. One slick tool. Market analysis, which includes the most widely-available enterprise data services. Overview of MPLS VPN and Ethernet implementations. Analysis of private cloud connections and software defined network technologies. Download the product brochure on this page to get the full scoop (including prices and licensing) or click here to ask a specific question about what this subscription gets you. 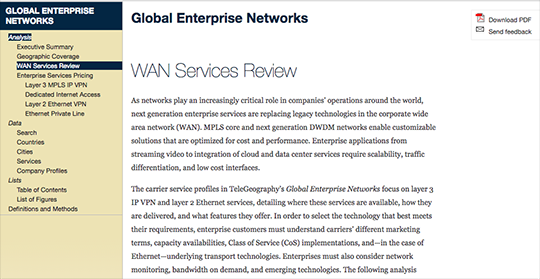 Explore the data and analysis in the Cloud and WAN Infrastructure. As a global operator, keeping up to speed with the rapidly changing international telecoms landscape has never been more critical. Telegeography’s telecom sector focus and data driven network analysis sets them apart as providers of credible market data and insights.